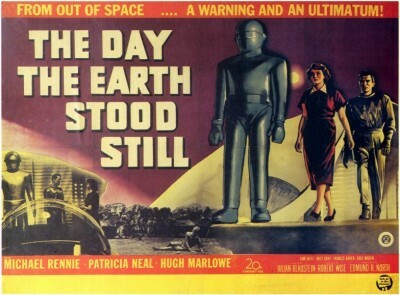 One of the true landmarks of science fiction cinema, The Day the Earth Stood Still (1951), "the Original Sci-Fi Masterpiece" according to the Blu-ray's cover text, comes to high-def as an ancillary, symbiotic release tied to its high-profile remake with Keanu Reeves. Probably more than a few naïve consumers will pick this up assuming it is the Reeves film, and in any case the disc comes with an "e-Movie Cash code" for the remake. The disc's main menu is preceded by a very long (7:48) "sneak peek" of the new film; it's so crammed with spoilers that interested parties might actually decide they no longer have any reason to see it after viewing this extended trailer. Especially trite is Helen's first-class jerk of a fiancé, Tom Stevens (Hugh Marlowe). A painfully clichéd character designed to keep the plot moving along and to add suspense, the character begs the question: Why would Helen ever even consider dating such a man? In every scene in the picture he reveals new characteristics, all of them negative: he's impatient, greedy, irresponsible with children, jealous, suspicious, nosy, condescending, sexist, selfish ("I don't care about the rest of the world! "), a thief, and a snitch! Some boyfriend!